We've just stepped into September (you don't have to wake me up when it ends. I'll already be awake. I've got too much to do), but it's not too early to be looking further into the year. November will be here before we know it (which includes my favorite holiday of the year). That means some new Warmachine releases will also be here before we know it. And we've got some preview pics to show for it. As turn the wrenches of the mechaniks, so turns the war. Trencher combat engineers are even tougher and more combat-ready than their field mechanik counterparts in the regular Cygnaran Army. Every man and woman among them must be as adept with a firearm as they are at maintaining and repairing the warjacks and weapons of the platoon. TRADE POINTS: Trencher Combat Engineers are a great unit for players looking to increase the fighting power of their support forces. Compared to the traditional Field Mechaniks (PIP 31092), the Combat Engineers offers a more elite option for repairing warjacks, battle engines, and structures such as the new Trencher Blockhouse (PIP 31136). Blockhouses are often built to support Cygnaran trenchworks, providing girded fire bays and supporting fire in the event of an enemy overrun of the front. Able to withstand direct artillery fire from all but the heaviest enemy guns, these blockhouses return fire with salvos from their impressive cannons while acting as mustering points to reinforce embattled trencher platoons. 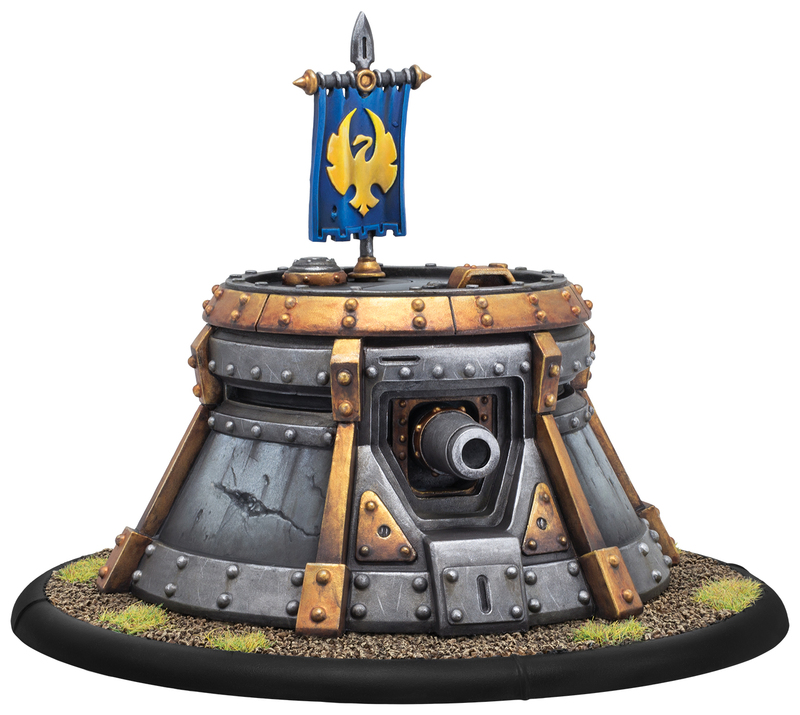 TRADE POINTS: The Trencher Blockhouse introduces an entirely new model type to WARMACHINE: Structures. These 120 mm-based models are centerpieces of any army, providing devastating firepower and valuable support. The Trencher Blockhouse in particular works well with all trencher units, but especially Trencher Infantry (PIP 31105) and Trencher Commandos (PIP 31064), as it returns destroyed soldiers from these units back to play. TRADE POINTS: The Trencher Express Team is a mobile weapon team that packs a hefty punch. Any warcaster that can increase the range of its deadly weapon, such as Lieutenant Allister Caine (PIP 31065) or Commander Coleman Stryker (PIP 31084), will greatly improve the capability of this new weapon crew. Masters of covert operations, sabotage, and targeted elimination behind enemy lines, the officers of the trencher commandos are the best of the best. These officers lead squads of commandos on the most dangerous and sensitive assignments, where their paramount goal is always simple: complete the mission at any cost. TRADE POINTS: This command attachment must be attached to the Trencher Commando unit (PIP 31064), and transforms what was already a highly deadly strike team into an absolute force of devastation that any player will enjoy bringing to the table. 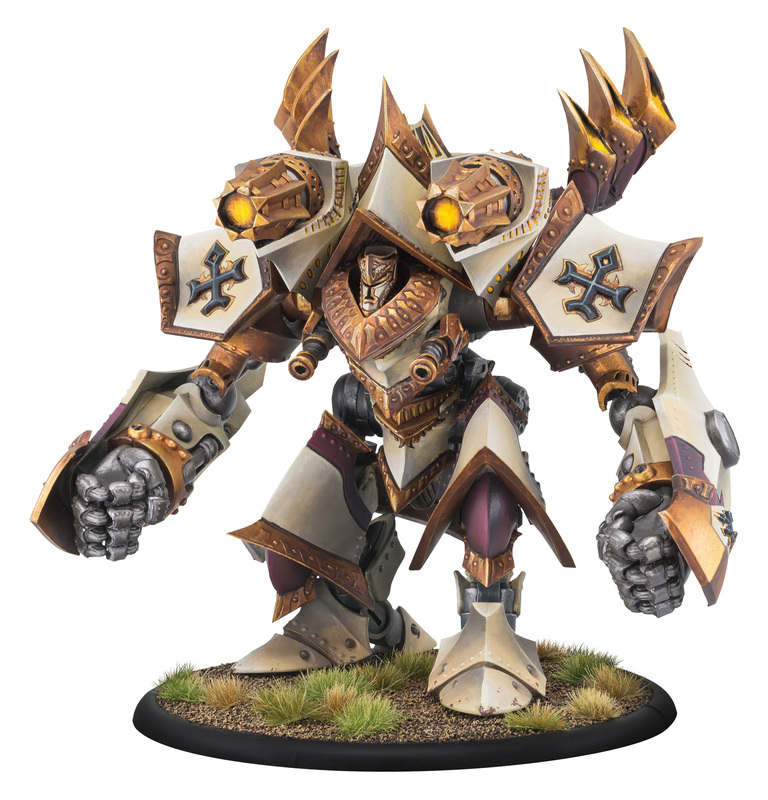 The consecrated colossals of the Protectorate of Menoth are towering masterpieces of faith and war. The Revelator strips away the obscuring magic of profane casters and scorches the earth to leave nothing but ashes behind, while the Judicator fills the sky with screaming rockets to rain down on unbelievers like Menoth’s own judgment. 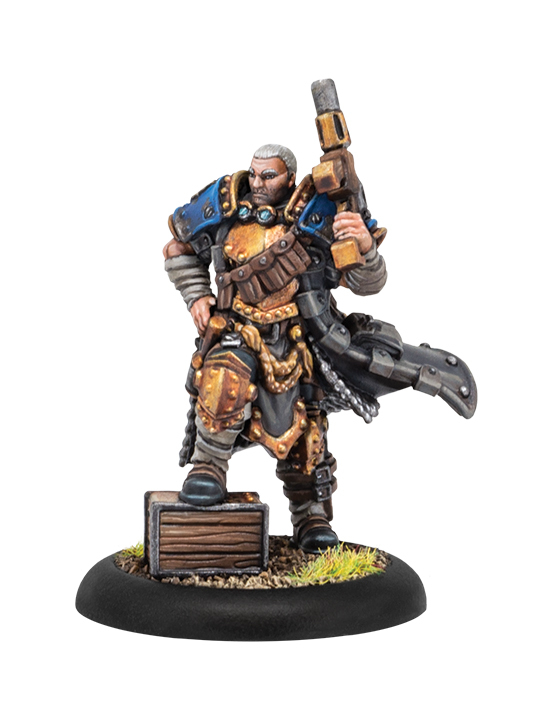 TRADE POINTS: This new kit allows players to build either the Judicator, which was previously sold as a separate kit in resin and metal (PIP 32050), or the highly anticipated Revelator, both in glorious hard plastic. Both of these 120 mm-based Colossals are a centerpiece to any Protectorate army, and pair well with many different forces. The newest option, the Revelator, works particularly well with warcasters who favor a strong ranged game, such as High Exemplar Kreoss (PIP 32080), Grand Scrutator Severius (PIP 32114), or Hierarch Severius (PIP 32049). TRADE POINTS: Player feedback from the recent Community Integrated Development cycle on the various Northkin models demonstrated just how excited the community is for this unique Trollblood unit. A pair of trained fighting bears and their handler, this unit ambushes onto the battlefield and mauls anything in their path. This unit, like many of the upcoming Northkin releases, pairs well with both Borka, Vengeance of the Rimshaws (PIP 71085) and Kolgrima Stonetruth, Winter Witch (PIP 71117). Dedicated raiding bands are vital for smaller kriels that rely on their spoils to survive. These skirmishers use ambushes and hit-and-run tactics. Raiders carry firebombs used to set buildings ablaze to distract sentries and lure them from storehouses, bombs equally effective against massed infantry. It is also their job to plunder downed foes after a skirmish, a task veteran warriors consider beneath them. TRADE POINTS: This new unit of Northkin warriors is an excellent building block for any player beginning to collect a Trollblood Northkin army. The Raiders work best with traditional Trollblood infantry support such as the Fell Caller Hero (PIP 71019). Among the Northkin leadership are their revered elders, many of whom are also powerful mystics, either shamans or sorcerers who can lend the cold of the north to the power already contained in krielstones to strengthen their allies. The winds they summon can speed an army into the fray or lend bite to the winter magics of other mystics. TRADE POINTS: The Northkin Elder is an alternate command attachment for the classic Krielstone Bearer & Stone Scribe unit (PIP 71091). The Krielstone Bearers have long been a staple in any Trollblood army, and this is no different in a Trollblood Northkin force. The Northkin Elder supplements the Krielstone’s protective aura to provide additional benefits specifically designed for an all Northkin force. TRADE POINTS: Valka is a self-sufficient combat solo that can tear through enemy soldiers with ease. His fighting strength is only increased when fellow Trollblood soldiers die near him, making him an excellent pair with the new Northkin Raiders (PIP 71110) or traditional infantry such as Trollkin Fennblades (PIP 71042) or Trollkin Champions (PIP 71069). Kolgrima Stonetruth is a half-mad and mystifying oracle. Born with the gift of sorcery, this trollkin witch could read the threads of the future in entrails and bones, glimpse fates in the eddies and whorls of a blizzard, and divine the destiny of a people in a patch of frostbite blackening a limb. Kolgrima emerged from the cave serving as her mountain lair when enemies threaten the north, accompanied by a great pack of winter trolls and serving as ancient war leader rather than oracle. TRADE POINTS: Kolgrima is the newest warlock to join the Trollblood arsenal and an excellent choice in any Northkin themed army. She is a board control caster that excels at delivering melee forces into the enemies ranks unharmed. As such, elite melee forces such as Trollkin Long Riders (PIP 71080), Trollkin Champions (PIP 71069), and warbeasts such as Rok (PIP 71102) are well supported by her. Obviously, a lot more written about than we've got pictures for. But don't worry, I'll keep checking and let you know when I see more.